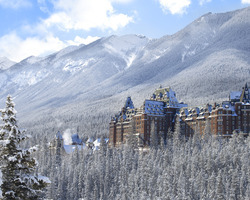 Save 15%, 30% or even 40% on your trip when you stay at one of these Fairmont flagship hotels. This pretty much eliminates ALL excuses for not visiting Banff/Lake Louise/Sunshine this coming season! Everyone, and we mean everyone we send to these fabulous properties comes back raving about their experience. Your savings could range from $200-1000 depending on your dates and accommodations chosen! Travel must be completed by April 30, 2016.